George Washington never had wooden teeth. Washington lost most of his teeth at a relatively young age and opted for dentures made by Dr. John Greenwood (maybe where the “wooden” teeth came from: “Greenwood teeth?”) In any event, they were carved from ivory and also contained quite a bit of gold and some lead. Human and animal (horse and donkey) teeth were then riveted to the gold and ivory and the whole thing was set in place by a spring mechanism. This spring mechanism actually made it so Washington had to constantly hold his mouth shut with his jaw muscles, which is why he probably always looked so stern in portraits. In early models of his dentures, the false teeth would be hooked to his remaining real teeth with metal wires. Eventually, he lost all his teeth and the dentures relied completely on the spring mechanism to stay in place. Washington actually had pretty meticulous dental hygiene for his time, including brushing his teeth daily and using mouthwash and a tongue scraper. However, he also suffered from constant toothaches and frequently took calomel (mercurous chloride) which can lead to destruction of the teeth. He also, like many of his day, used substances that were very abrasive to clean his mouth, which probably also led to the decay of his tooth enamel. So by a combination of that and probably having naturally bad teeth, this led to him losing his teeth steadily from the age of 22 until 55, when he officially had lost them all. Indeed, by his inauguration in 1789, he had only one natural tooth remaining, which I like to imagine he called “old chomper”. 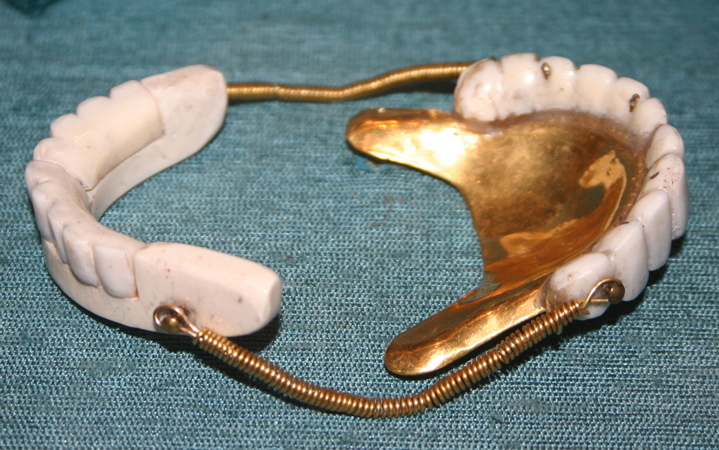 The University of Maryland Dental School once possessed one of the sets of dentures used by George Washington. They then lent one of the dentures in the set to the Smithsonian in 1976 for an exhibit. That dentures was stolen from a storage area of the Smithsonian and, to date, has not been recovered. Washington was known for having a series of serious illnesses throughout his life. At one point he had smallpox, which was followed the year after by “violent plurise”. A few years later, he suffered from dysentery and a severe continual “pain in the head”. Again a few years later, at the age of 29, he suffered from “breakbone fever”, which is now called “dengue fever”. The symptoms of this are: severe muscle and joint pain, fever, and strong headaches. He later contracted malaria and rheumatic fever. Throughout his life, he also suffered from a variety of tooth related problems including constant toothaches during his time as the commander of the Continental Army. Among his tooth problems included: frequently infected and abscessed teeth; inflamed gums; and problems related to his dentures. It’s no wonder that throughout his life he was constantly in search of a better dentist. Washington’s dental problems, which caused him constant pain throughout his life, are thought to have contributed to his short temper. He also had to forgo his second inaugural address because of dental problems. Near the end of his life, due to dental pain, he could only eat soft foods. If you look at portraits of Washington throughout the years, you can see a subtle change in his face directly caused by the changing of his denture models over the years as well as a scar that appeared at one point which was ultimately resulting from an abscessed tooth removal. Not only that, but in his 1797 Gilbert Stuart portrait, you can see that his mouth is swollen. Supposedly, the dentures were causing too much discomfort, so he removed them in favor of packing his mouth with cotton balls to support his lips.